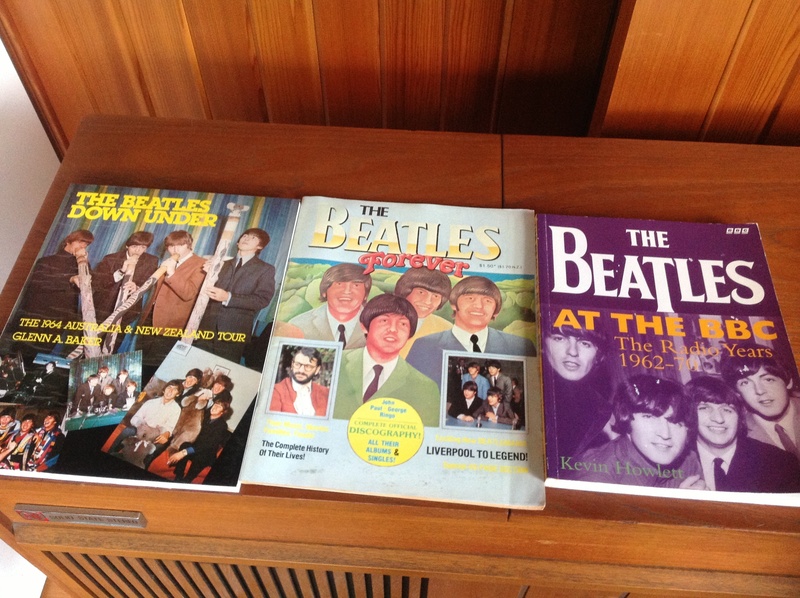 A picture of some really-cool rare Beatle collectables that my godparents gave me yesterday (thanks! ), sitting on our record player. As most Beatlemaniacs are aware, 2014 is a huge year in the Beatles calendar. Americans have been getting all hyped over their 50-years-since-The-Beatles-invaded-America celebrations, with festivities ranging from a beautiful photo-book called The Beatles: Six Days That Changed The World (I will do a review on it some point) to the now-infamous Grammy special screened on Foxtel back in February (I, ashamedly, have not seen this yet – our household does not have Foxtel, so my lovely godparents recorded it for us, but my stupid BluRay player repeatedly rejects the disc that they put it on). However, those over in the US of A are not the only people celebrating at the moment; here in The Great Southern Land/Terra Australis/Down Under/Australia, we’ve been having a Beatlemania revival, too (yay – for once, the rest of the country is acting like an extremely-understated version of moi!). Since last September, there has been a ‘Beatles In Australia’ exhibition doing the Sydney and Melbourne rounds. I was in Sydney for a weekend back in December, and Mum wanted to see an exhibition at the Powerhouse; to my delight, I discovered that the above exhibition was also being held there, so I’ve already seen it. I am, however, flying up to Melbourne very soon especially to re-view the exhibit, as a three-month-early birthday present – talk about being a Beatlemaniac! If it’s anything like it was in Sydney, there will be everything from original posters that a screaming fan proudly held up at The Fab Four’s Sydney Airport arrival, to John’s original suit from the tour! There was also an extremely large portion of Beatles merchandise for sale in the Powerhouse gift shop at the time – hopefully the Arts Centre have a shop, too! Anyway, if you turn out to be in Melbourne before the 1st of July, check it out – I, for one, really enjoyed it in Sydney (and hope to do so in Victoria, too). As for things going on back home in South Australia…The two major newspapers here (The Advertiser and The Sunday Mail) have been taking advantage of the 50th anniversary of John, Paul, George and Jimmie Nicol’s (who was the replacement drummer – poor Ringo was stuck in London with tonsillitis) visit to Adelaide – I, in turn, have been fattening my Beatles scrapbook with their twenty-million articles (which I am not complaining about)! Here in Adelaide, we made Beatles history by giving the boys their biggest reception ever – surprising, really, considering how small we are, but (as with before) I’m not complaining; all the former Beatles (except Ringo, of course) have commented on their Adelaide visit, and this makes me very proud to be South Australian. But anyway, check out the Sunday Mail today, and yesterday’s Advertiser (if you still have it) – yesterday, there was a giant four-page spread in the SA Weekend, plus an article on a security guard who got their signatures. Today, in the Mail, there was an article of a woman who met John and Paul in ’64, and got Paul’s signature in 1975 (what a lucky-duck). As for the TV – about a week ago, there was a half-hour special called Yesterday: The Beatles In Adelaide (thus, I assume, only screened here) on Channel 7, which was based around interviews with DJs/fans who were present, and a lot of archival footage (which was really interesting to look at). Despite the fact the documentary was ten years old, it was really good and I really enjoyed it. However, there’s another television special coming up on Tuesday, 10th of June (a new one!) on ABC1, called When The Beatles Drove Us Wild – apparently, this one is something very special, and unlike the former, it goes for a full hour, so tune in! So anyway, have a fab long weekend (I’ve listened to Abbey Road, read my new Beatles books/magazine pictured at the top of the post and posted on here), and enjoy the sunny day that has somehow found itself in the middle of Adelaide’s – to quote George Harrison – “long, cold, lonely Winter” (and trust me – Adelaide Winters are freezing). Good day sunshine, for now!